1683: No slaves shall gather on the Sabbath in any number greater than four. 1684: No slave shall sell or trade in any item whatsoever. 1692: No slaves shall be entertained at the houses of free blacks outside of the gates. 1692: No slaves shall play games or be disorderly on the Sabbath on pain of whipping. 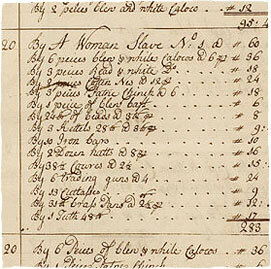 1702: Any slave who strikes a white man or woman shall be punished severely, short of loss of limb or life. 1702: Masters may punish their slaves however they choose so long as they do not cut off their limbs or kill them. 1702: No free white or black person is ever to entertain another man's slave. 1702: No more than three slaves can meet together at any time or place. Forty lashes on the naked back if they are found to do so. 1706: Baptizing a slave will not result in release from slavery. 1706: All children born of slave mothers shall be slaves as well. 1706: Slaves may never give testimony against a white person. 1708: Any slave murdering his or her master or conspiring to do so with others shall suffer a horrible death. 1712: Any slave convicted of conspiring with others to revolt against the whites shall suffer a horrible death. 1712: No black made free after this law shall be allowed to own any house or land or pass any other goods to his or her descendants. 1712: No slave is to be freed without a £200 bond being paid in case they become a public charge. 1712: No slave shall ever possess a gun or pistol.